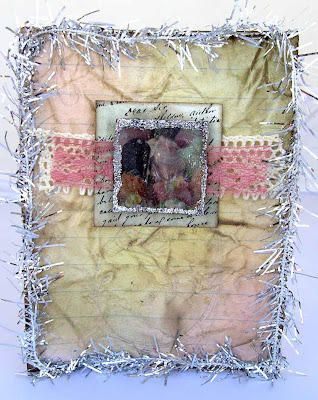 When I first spotted Donna Salazar's new Artistic Papers, I was really excited by the possibilities. I saw myself using my Shimmerz products, watercoloring and using my colored pencils to wild abandon. I was also intrigued by her Memory Mosaics and her Crafty Chronicles (basically an acid-free newspaper created for using in papercrafting.) However, the paper lines left me cold and uninspired because I'm not typically a Victorian, lacy, realistic flower pictures type-of girl. Normally, when I want to incorporate texture into my work, I use actual lace not a picture. However, once I got my hands on Donna Salazar's CHA-W 2010 line, I found myself really enjoying it. I found that my projects came together very quickly and I ended up liking it all...even those papers. 1. The artistic freedom that Donna Salazar collections allow. I like to design my own backgrounds so the neutral color palette on the patterned paper collections and the Artistic Paper Collection worked really well for me. If you are comfortable with mists and paints, you too will love the neutral colors because you can personalize. However, if you prefer to use the papers as-is, you might find the papers to be a bit dull. I also loved all the little things that I could cut out and use as embellishments. 2. I loved The Crafty Chronicles. They are the perfect weight to accept mists, paints and a great deal of scrunching. I loved using them in my artwork for flowers and I enjoyed reading them. 3. I think that the textures (aka realistic pictures of lace, ribbons, beads etc.) 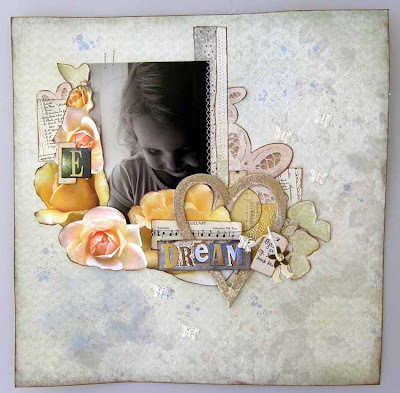 are great for people who don't have a massive stash of such items, but still want the look of texture on their project. They are also great for people who want the look of a 3-D layout, but still want their scrapbook album to lay flat. 1. The weight of the artistic papers. They stand up pretty well to misting and painting, but I found that they needed a cardstock backing to stay nice and flat. For a paper that is made for painting, I'd like a heavier weight. 2. I'd love to see some chunky embellishments too. Some pretty antique metal accents? Some buttons? Oh, and some trims, too! 3. A beginner may find Donna Salazar products to be overwhelming. In order to personalize them, you'll need mists, inks, paints etc. A beginning crafter may not have these products yet. However, someone (like me) who has been around for a bit will enjoy digging through her stash. On each of my projects, I used a lot of Shimmerz products to add color and sparkle. Mists and paints are a perfect partner to Donna Salazar's product line. I really enjoyed cutting out the various elements from the papers and layering them too. Adding a bit of sewing lent texture as did some distressing. It seems that these products are made for distressing. 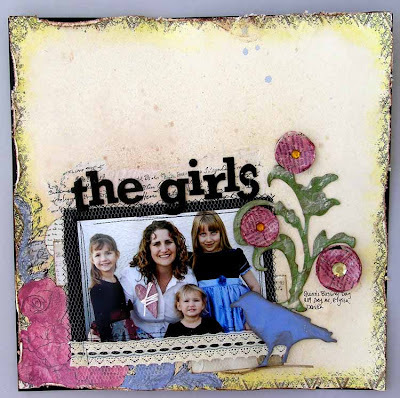 On The Girls, I experimented with the Artistic Papers. It was very satisfying to personalize my background to match my photo. 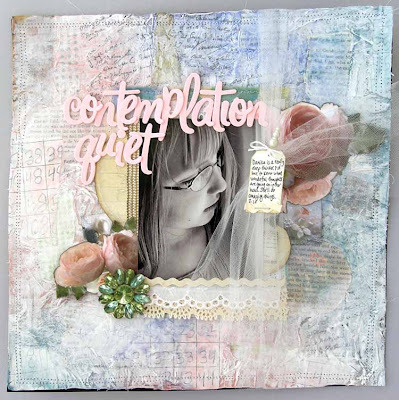 On Contemplation Quiet, I used a piece of background paper that I made using muslin, tissue paper and bits of scraps and layered Donna Salazar papers on top. (If you are interested in learning how to make this background, please watch the videos here. The green jewel is really a piece of paper although, it appears to be dimensional. Cool huh? Finally, I wanted to experiment with some clear Crackle Paint over one of Donna Salazar's small images. Even though the paper curled, it gave it a thick, interesting look. I personalized the background paper by spritzing with Shimmerz, scrunching it in my fist and inking the raised portions. I love how it turned out. I have to be totally honest. I knew I'd love the Artistic Paper Collection, the Mosaic Memory Collection and The Crafty Chronicles, but I wasn't so sure I'd like Donna Salazar's other pattern paper collections. However, the more I used them and the more I thought about them, the more I loved them. (I wasn't expecting that.) Now, I'm totally and completely hooked. Donna Salazar is an artist and therefore she creates products for other like-minded individuals: people who own way too many tubes of paint, mists galore, all of the Distress Inks and enjoy making a major mess on the crafting table. 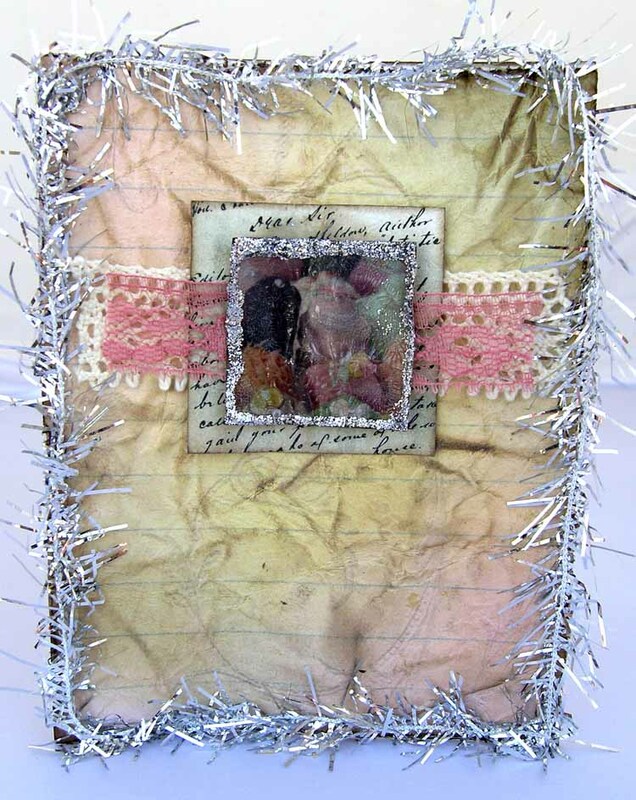 She expects you to alter her papers with crazy abandon: tossing paint, experimenting with beeswax, adding bling. If I'm describing you, you too will love Donna Salazar's products. If you prefer a cleaner environment (aka paint-free carpets), you might be happier with another manufacturer. Personally, I can see myself coming back frequently to experiment and play with these collections. In fact, I'm already inspired to make a few tags...better get out my inks! I know most of the comments following the new release sneaks were negative. Has this line grown on you since then? Perhaps you can picture more possibilities after seeing it used? What is your opinion? The Crafty Chronicle catches my eye! Would love to read and use the paper in projects! I think I would adore her papers if I were a scrapbooker, just haven't converted from card making, yet. With 3 tiny kids under me, this kind of crafting isn't my style. I love it all! It's all different and genius. love love love! I love the papers - they are great with the Destress-it-all ... I Love the Roses the best! I haven't used the artistic ones yet.. (hoarding) I am going to use these as a mini project at "Scrap Camp" in my store... You have to show them to get them to buy is what I have learned when you are outta the Box! The Corragated Chipboard is GREAT! I can't wait to see what CHA brings in this next release! Looks like some really cool colors and designs of paper!! If I didn't have a little one who likes my scrappy desk to play in, I would be interested in the papers and would give them a try but the rest of the stuff doesn't really interested me. I also would like to see buttons, trims, dimensional flowers,and such. Thanks for sharing. If I had more time, I think I'd love it! I do love the new smooch colors though! you've done a great job of convincing me that they may be worth a try with my mists and paints. I'm not the messy crafter type BUT I must say after seeing what you created with these...hmm I may have to give it a try! OH, and I have played with the Crafty Chronicle at a class that I took at my LSS and I loved it!!! I need several of them b/c they are so cute and the articles are actually funny and are great to document my scrap-life! I love messy. Often come to work and someone will comment about the layout I worked on last night must've been blue, green, yellow, red...or whatever color my fingers are currently misted or painted. I'd love to try these products, but haven't seen them anywhere. I'm really intrigued by the Mosaics. Donna is so dang creative, and her use of everyday objects is fantastic. Her flowers help the crafter use there creative mind and make it there own. No two and exactly alike and that is one of the things that make this so appealing. Chunky accents would be great with this line. Rock on Donna!